A spiny annual with bright yellow flowers and dandelion-like leaves, buffalo bur is an introduced member of the nightshade family. Taprooted annual with stems completely covered with sharp bristles. Flowers single from upper leaf axils, bright yellow, about 1 inch across with 5 united petals, forming a 5-pointed star with 5 anthers protruding; the lowermost anther is elongated like a beak. The calyx is almost concealed by bristles. Blooms May–October. Leaves alternate on spiny stems, deeply lobed almost to midrib, the main lobes further lobed. Fruit a globe-shaped berry entirely covered by bristles that adhere to animals. 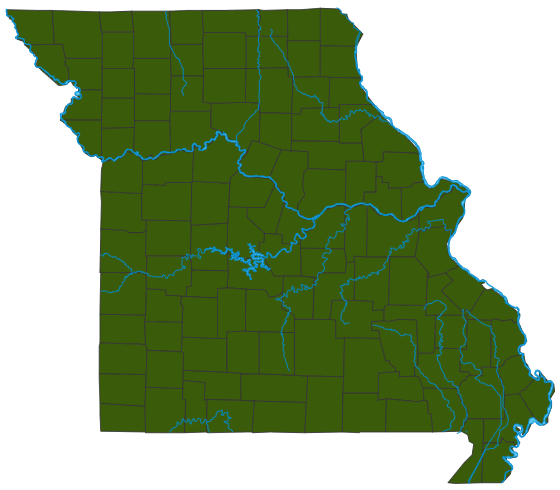 Similar species: There are 13 species in the genus Solanum recorded for Missouri. One is the common garden tomato, S. lycopersicum. The prickly fruits of buffalo bur easily attach to animal fur, dispersing the seeds from the parent plant. The feet of livestock (and people!) can be injured by the spiny prickles of buffalo bur. Buffalo bur is scattered nearly statewide. It occurs in a variety of open, disturbed places. Banks of streams and rivers, disturbed portions of upland prairies, pastures, farmyards, roadsides, and other open, disturbed places. Interestingly, even though this species is considered an introduced plant, a specimen of it was collected in about 1810 by Thomas Nuttall, one of the two earliest botanists to visit what is now Missouri. Like other members of the nightshade family, this plant is probably toxic if eaten. The prickly spines on the foliage and fruits make any attempt to eat it unlikely. Livestock avoid the plant. Buffalo bur is considered undesirable in pastures. The feet of livestock (and people!) can be injured by the spiny prickles of these plants. Grazing animals’ mouths can be damaged by the spines, too. When the fruits become embedded in the fleece of sheep, it can injure the sheep and reduce the wool value. The burlike prickles on the fruits cause them to become attached to animal fur. This enables them to be dispersed away from the parent plant. When the mature plant dries, it often breaks off at the base and rolls with the wind, dispersing seeds as it goes.